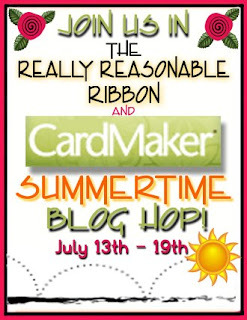 My Pieces of Time: RRR Blog Hop Time!!!!! It's that time again! Time for another Really Reasonable Ribbon Blog Hop. 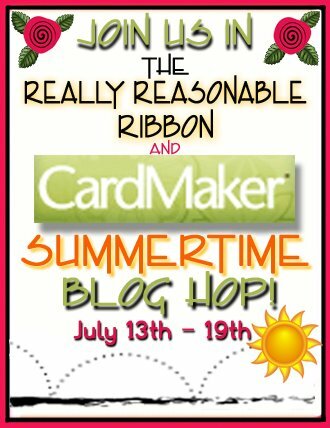 This month we're teaming up with CardMaker. We're also featuring Scor-Pal products! I know you will enjoy seeing all the inspiration this month, so please join us for the Hop!!! And here is my project. This is a page of my cousins daughter at the beach. I used several varieties from the assortment. 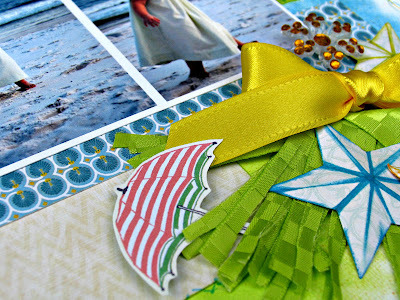 I loved the green star ribbon, it really suited the beach theme! And the colors are beautiful!!! Here you can see where I used the Scor-Buddy on the stars, making them dimensional. I added ink in matching colors! This is another closeup that shows how I shredded the green block ribbon and used it as a base for my cluster of stars. 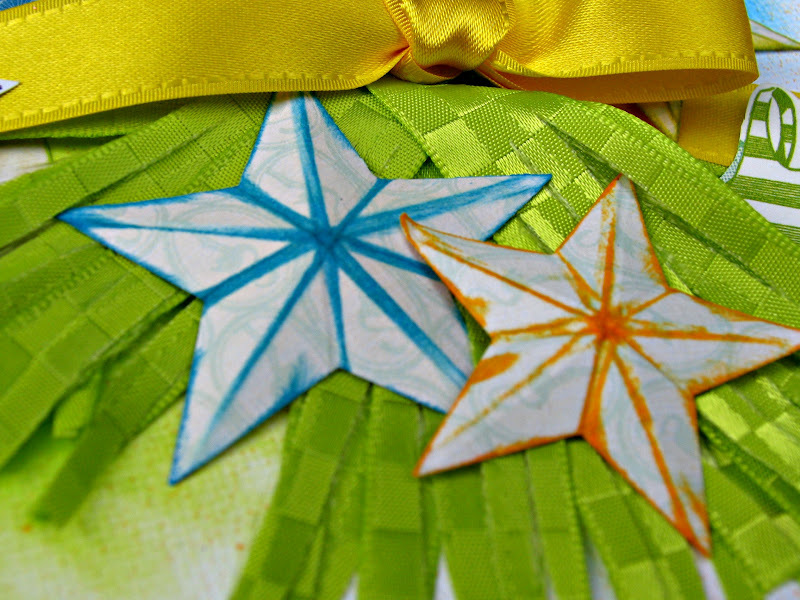 This just shows the smaller bow from the super cute star ribbon! I also inked behind the pieces of pattern paper and used my Zig markers for my faux stitching! Thanks so much for hopping along with us, we hope you enjoy your trip!!! What a stunning layout. So vibrant, just beautiful. What a color spectacular! Your LO is just fantastic and so bursting with life, love it! So beautiful! Love everything about this layout! Love what you did with all that ribbon. Great ideas! What a super fun LO!! Great details and great use of the ribbon! Beautiful layout! Love the splashes of paint! Wow!! I can't stop looking at it. There are so many details. Great page. this layout is amazing! What a stunning way to highlight such beautiful pictures! I really love this! OMG WOW!! This totally rocks!!!! Ohhh so sweet and lovely! This is a terrific layout Patti. I love the dimensional stars and the way you shredded the apple green ribbon. It created a really cool look. Very creative!! Great page. love how you used the ribbon...esp the shredded ribbon---great idea! This is neat! I love how the ribbon (green) mimics the splashes of color around the image. Such a beautiful page! Love the ribbon choices. Fantastic layout--I like the stars and the star ribbon. Such an inspiring scrap page! it is so colorful and fun. how you used the ribbon shredded was great. thanks for sharing. Wow! What a very cute layout! That layout is wonderful. 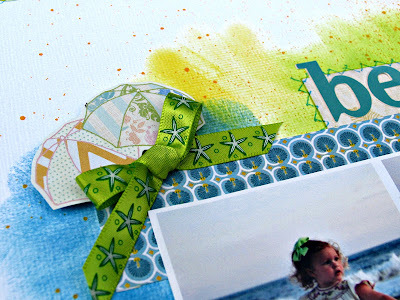 Love the colors and how you used the ribbon! beautiful! love the vivid colors! Stunning photos for a stunning layout! TFS! What a fabulous LO! Great use of the ribbon! So great! I love everything about this but especially the way you inked the page and the ribbon! Ahh so sweet,what an adorable child and great ribbon idea too. Beautiful layout! Love the colors! Beautiful layout! Love the use of the ribbons. It's neat to see how the photos are the central focus and you can use the bright colors without overwhelming the photos. What a fun layout and great colors with those adorable pictures. Love this layout! Awesome way to use the ribbon! What an amazing layout with a very beautiful subject. Wow! The details and ribbons are just great! The stars that you created are absolutely amazing! And they have given me an idea! Thank you so much for sharing your wonderful layout with us! Colourful and summery! How clever! I love the shredded green block ribbon! So beautiful! Love everything about this layout! Great job!! You had the perfect little dumpling to build a page around and you did it beautifully! I'm so happy to see so many shades of green in this collection, since it's one of my favorite colors. Such nice touches and unusual use of the ribbon. Love it. Beautiful layout--I'm a beach girl too!! This is a very beautiful summer layout. 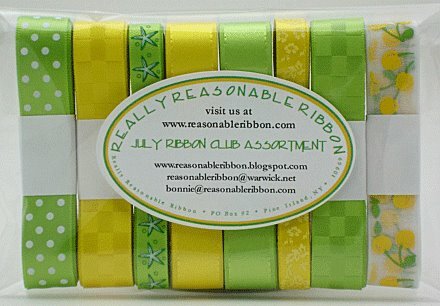 The colors are brillant and really like the ribbon. Great layout and great use of your ribbon. Wonderful layout!! So talented!! Thank you for sharing with us!! Anna Griffin on HSN today!! !